Cold-blooded but rarely clammy, reptiles are represented by such models as turtles, snakes, crocodilians, and lizards. When watching a large iguana basking on a rock, it’s easy to see the dinosaur ancestry (despite the types of changes that result from millions of years of evolution). Alligators and crocodiles, on the other hand, are nearly pristine replicas of their pre-historic lineage. Although much more commonly encountered in the tropics and deserts, some extremely well-adjusted reptile species can be found well into the arctic circle. These ectotherms (creatures that can’t regulate their own body heat) have evolved to reproduce in three different ways depending on their species. Some reptiles lay eggs, while others give live birth. There are other species, still, which produce live young that develop inside of eggs, within the parents’ body prior to emerging, by all appearances, as an ordinary, live-born animal. This album features a vast assortment of species from jungle, swamp, and desert, alike. Green anoles are only actually green when they're feeling healthy and confident. They turn brown when encountering a predator, but when it's feeling extra brazen, a male might go as far as to perform territorial "push-ups," while puffing out his red dewlap (throat). Photo taken at Lake Louisa State Park, FL, USA. This enormous zebra-tailed lizard had an even bigger ego. Upon my approach for a close shot, rather than fleeing, this brazen lizard decided to make a territorial display. He looks rather human in this shot. Saguaro NP East, AZ. Black rat snake in her natural environment. Due to their body structures and means of movement, snakes are often frustrating photo subjects, making it hard to pass on the more "photogenic" individuals. Photo taken near Danville, PA, USA. Using it's tail as a stilt, this desert iguana manages to balance in the lower creosote branches. It's enjoying a favorite dish, the creosote's delicious flowers. Saguaro NP West, AZ. Not unlike humans, the male gender of many lizard species are rather territorial. 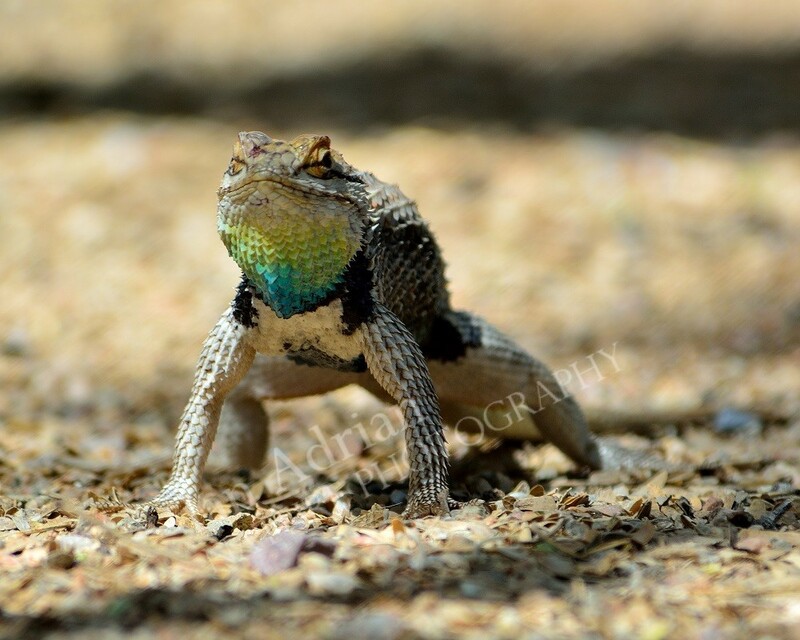 One of the many ways that some lizards (such as this Desert Spiny Lizard) show their bravado is by performing territorial "push-ups." This fellow's brazen masculinity made for an excellent photo op! Tucson, AZ, USA. An extremely common, yet (due to their small size and nocturnal habits) rarely encountered lizard, the banded is Arizona's only native gecko. Picture Rocks, AZ, USA. Greater Earless Lizard, striking the perfect pose to have his picture taken. Photo taken at Rockhound State Park, NM, USA. Brown anoles are an invasive species which have effectively displaced their native green kin in many sub-arboreal habitats throughout Florida. This fellow is performing a territorial display. Photo taken at Lake Louisa State Park, FL, USA. Mediterranean House Gecko found in my backyard, a bit far from home. These tiny geckos have successfully established themselves in Phoenix, Tucson, and a number of other metropolitan areas in warmer parts of America. Interestingly enough, this area's climate is pretty similar to that of their home range, making for an ideal match. Despite their success, this species doesn't appear to be having a negative impact on native species. This may be largely due to their presence strictly in/around cities, as well as their arboreal / nocturnal niche, one that seems to be largely unoccupied by local species of lizards. Picture Rocks, AZ.